Your GSM dashboard now allows you to get an overview of your multi-site deployment. You can view multiple dashboards at the same time, get overviews for a specific dashboard, and drill down for additional information on a specific site. The system displays a summary bar, which gives you an overview of all of your sites. To view additional site information, hover over the word Sites. The system displays a site overview. Threat Detection History — A historic view of all threats encountered over a seven day period. Device Activations — A historic view of new device activations over a seven day period. Managed by Policy – Count of devices which are managed versus unmanaged. Agent version Spread — Count of WSA agent versions installed. Realtime Shield Status — Count of devices with their Reatime shied on and off. Expired Status — Count of devices which are on an expired keycode. 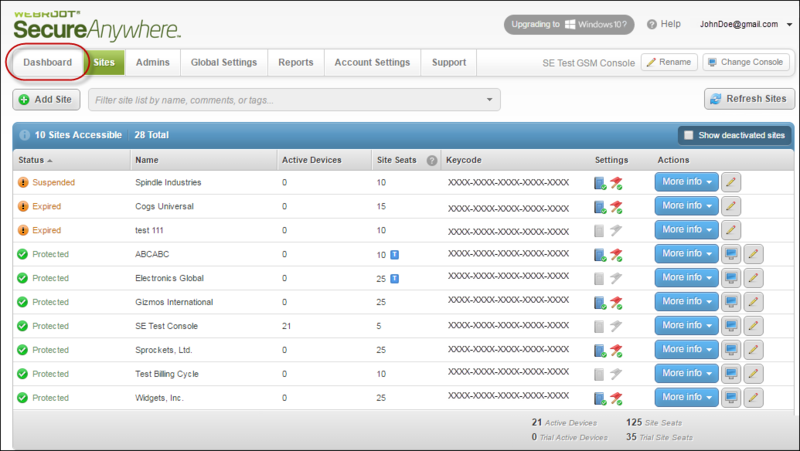 Remediation Status — Count of devices with remediation, or clean up, enabled by default. 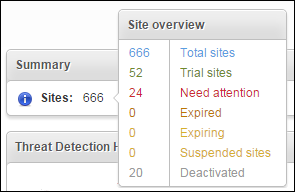 To configure which sites will display in the dashboard, click the Site Filter button. 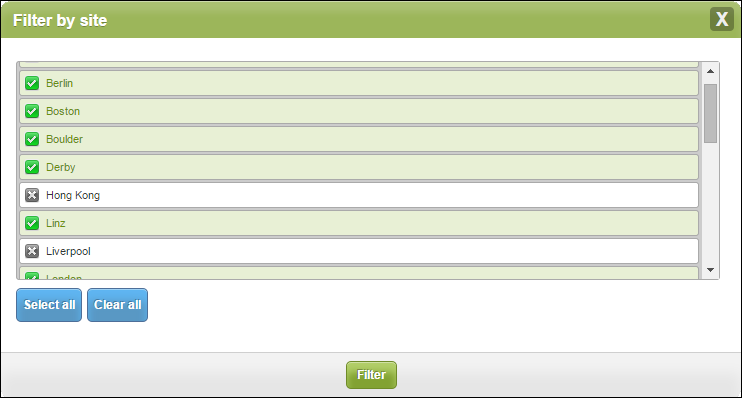 The system displays the Filter by site window. Select a site to have it display in the dashbord. Click the Select all button to select all sites to display in the dashboard. Click the Clear all button to remove all sites from displaying in the dashboard. 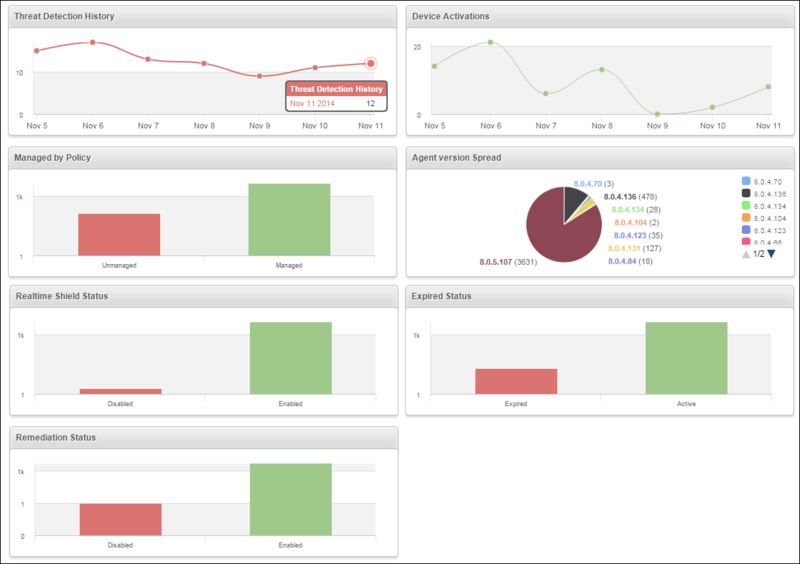 Additionally, you can drag and drop any of the dashboards to a new location. To put the dashboards in their original locations, click the Reset to chart defaults button. To drill down for additional information about each site, hover over the chart, then click on the window that displays. The system displays additional information, including host name and keycode. For additional information, click the View More link.